In a recent article I reminded you to terminate every unused port in your system. It didn’t seem like a controversial statement. Yet, I’ve gotten some feedback about it. I thought that it would be a good time to talk about termination and why I stand behind my earlier article. I think that a lot of people had older relatives who worried that the electricity was going to “leak out” of unused outlets. I myself knew someone who put those childproofing things in unused outlets. We all know that isn’t true. We know electricity isn’t like that. Except it kinda is, and signal flow kinda is too. The reason you don’t get an electric shock just standing near an outlet is that there’s enough resistance in the air to overcome the relatively low current flowing through your house. If you were running 40,000 volts through your house (and I do not recommend that) the current might actually spark out at you when you stood near an outlet. When you have an unterminated port on a splitter or an open port coming through a wall, there is nowhere near enough voltage on that line for the signal to “leak out.” However what you are doing is introducing an impedance mismatch; the impedance of the cable is different from the impedance of the air. This creates an imbalance in the system that can drop the signal level by about half (or 3dB.) The simple act of placing a terminator on the end of a connector preserves the proper operation of the cable. It keeps everything at a nice 75 ohms, the proper impedance for this type of coax cable. Cable companies leave unterminated ports all the time. That’s true. Look at homes prewired for cable and you’ll see open ports all over the place. This falls under the category of “If your friend jumped off a bridge, would you?” If you’re over 40 you probably heard that in your youth. What I’m saying here is that the cable company does it, but that doesn’t mean it’s right. What it means is, the signal coming from the cable system is on average about 25 times stronger than a satellite TV signal so they can afford to lose a little. Cable installers probably should terminate but it doesn’t really create problems in the kind of installs they do. What about dust caps, smartypants? 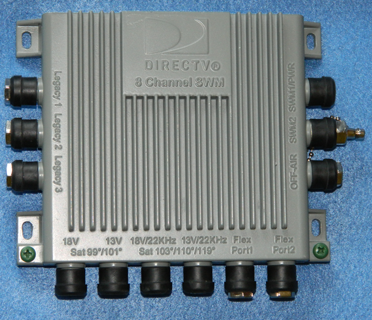 DIRECTV multiswitches come with dust caps on a lot of the ports. You can see them on the picture above. Only the port labeled “SWM2” has a real terminator; the rest of the ports have dust caps. A dust cap isn’t a terminator. It’s just a dumb cover and doesn’t do anything. There are some pieces of hardware that are self-terminating, meaning they have a terminator built in. I am not sure why everything isn’t self-terminating but it probably comes down to money. Regardless, if the thing actually comes with a dust cap, then use the dust cap, that’s fine. A terminator is a cheap way to make sure your wiring works the way it is intended to work. A bag of 100 is probably more than you will use in your life and it costs about the same as one movie ticket. It takes about 10 seconds to connect a terminator, so why not do it?